It’s probably one of the worst kept secrets from Sony, But yesterday they officially announced Uncharted: The Nathan Drake Collection, Which is a collection of the original Uncharted trilogy polished up for PlayStation 4. Developed by Bluepoint Games. Coming October 9th in the US and October 7th in Europe. That means not only allowing you to play the single-player campaigns of Uncharted: Drake’s Fortune, Uncharted 2: Among Thieves, and Uncharted 3: Drake’s Deception in 1080p and 60fps with better lighting, textures, and models, but they’re also working on a range of improvements and additions across all three games. 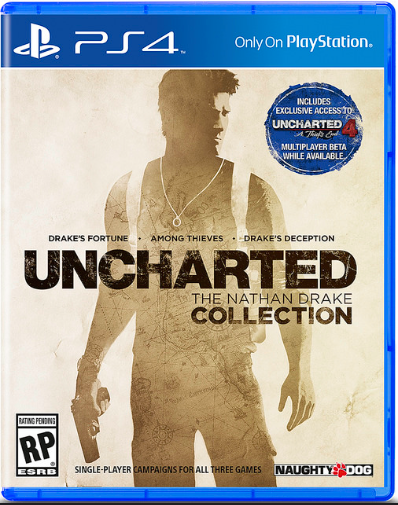 By pre-ordering Uncharted: The Nathan Drake Collection now, you can receive the Nathan Drake Pack which includes single player skins of iconic Drake outfits as well as everyone’s favorite weapons: the Golden AK-47 and Golden 92FS guns. If you pre-order the digital download via the PlayStation Store, you will also get an Uncharted: Nathan Drake Collection PS4 dynamic theme.